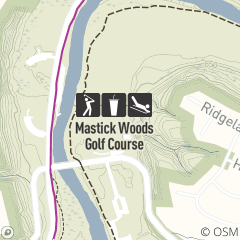 Mastick Woods Golf Course offers a relaxed nine-holes, great for those just starting out or family golfers. Not a golfer? Try out FootGolf, cross-country skiing or sledding! Like the two other courses in the Rocky River Valley, Mastick Woods Golf course gives the feeling of being in the midst of an Appalachian forest. The vista is almost entirely trees and sky. The course layout was completed by Harry Burkhardt, the first superintendent of golf for Cleveland Metroparks, and was constructed by Park District staff in 1964. The 9-hole course was constructed to ease the crowded conditions at Big Met and Little Met golf courses and offer golfers a special experience. With its executive length, Mastick Woods Golf Course is ideal for juniors, new players or those looking for a leisurely golf experience.